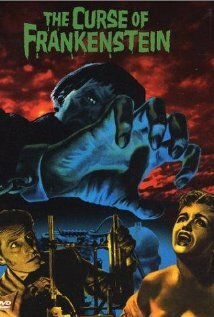 So, I watched the 1957 Hammer film, The Curse of Frankenstein. Staring Peter Cushing as Doctor Frankenstein and Christopher Lee as the Monster in this stylistic British period pieces. Well acted, well written and a little boring, this movie suffered from the too much talking and not enough monster action. Perhaps I started watching it a little too late in the evening, and that may have made it seem more boring than it was… I don’t know, Hammer Films are good films, and this is not a bad film, just a little long winded. Christopher Lee makes an awesome Monster, and actually one of the better looking ones, in my opinion – I just wish we had seen more of him. So, I am disappointed with this film, but it’s not terrible. I’ll be watching more Hammer Films in the future, as the are great Film company, and their Dracula series is top notch (and also stars Peter Cushing and Christopher Lee). Expect to see a few of those discussed here in the future.